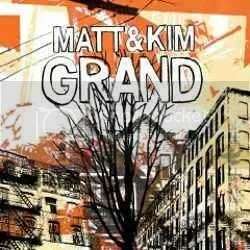 Matt & Kim’s self-titled debut was released in 2006, and Grand, the follow-up, was released in 2009. I’m reviewing them now because, while scouring the internet for shows coming to my area, I found that this Brooklyn-based duo is scheduled to play around here very soon. Not many bands playing original music play near where I live, so when there is one coming to town, I usually try to go. Unless the band is awful. I set out on a quest to see if Matt & Kim are awful or if I should plan to go check them out. The overwhelming verdict after listening to their albums is that I am most definitely going to go to their show. Both of the albums are similar in sound, so no need to split up their reviews. Upbeat drumming, keyboards, a girl drummer (represent! ), and a vocalist who sings like a way cooler version of John Darnielle, though still in a very nerd-esque manner? Count me in. The songs are fun and full of energy. I dig the lyrics, too. A better, more rocking version of Mates Of State. 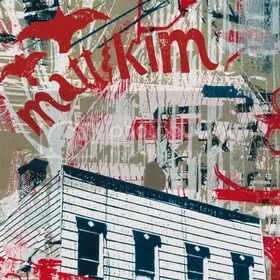 Matt & Kim are a band that I have overlooked the past few years and I am very happy to finally have introduced my ears to them. I can only hope that the show is filled with lots of dancing, jumping around, singing out loud, and general hijinks. See you there, hipster friends. This entry was posted on March 14, 2010 at 12:00 pm and filed under TheSlacker. You can follow any responses to this entry through the RSS feed. « THIS PROVIDENCE – Who Are You Now?